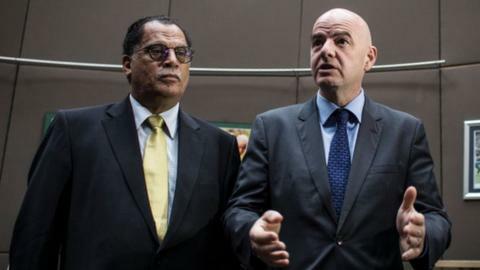 Danny Jordaan guided Fifa chief Gianni Infantino on a tour of the South African FA in late February. South African FA president Danny Jordaan has pulled out of the race to be a member of the Fifa Council. South Sudan's Chabur Goc Alei has also withdrawn from the race, as he did in 2016, while Zambian Kalusha Bwalya abandoned his bid over the weekend. The withdrawals were revealed in a letter sent by the Confederation of African Football (Caf) to the continent's member associations. Caf confirmed the eligibility of 10 candidates for next week's elections. This came after Fifa's Governance Committee approved their candidacy following eligibility checks, which Fifa introduced following the corruption scandal of 2015. Topping the list are Caf president Issa Hayatou and Madagascar FA head Ahmad, the Cameroonian's sole challenger in the presidential elections on 16 March. Whoever wins the presidential vote in the Ethiopian capital Addis Ababa will automatically assume a vice-presidential role on the Fifa Council. Following the withdrawal of Jordaan, Goc and Bwalya, eight contestants are left to bid for the six further African places in the Fifa Council. One of these will go to Burundi's Lydia Nsekera who is assured her place since Fifa stipulates there must be at least one female member from the continent. She is the sole woman among the applicants. Five of the remaining contestants already sit on the Fifa Council: Tarek Bouchamoui (Tunisia), Almamy Kabele Camara (Guinea), Kwesi Nyantakyi (Ghana), Constant Omari (DR Congo), and Hany Abo Rida (Egypt). Meanwhile, both Augustin Sidy Diallo of Ivory Coast and Tanzania's Leodegar Tenga are bidding to be elected for the first time. The successful candidates will all serve on the Fifa Council for a four-year spell that will end in 2021. Caf confirmed the eligibility checks of ten candidates in a letter to member associations. Alei's withdrawal from the Fifa compounded a difficult period for the South Sudanese. On Monday, he lost his presidency of South Sudan's FA (SSFA) as an Extraordinary General Assembly elected Adelmo Wani Agustino in his place on an interim basis. "I may come back and contest in April," Alei, who had led the SSFA for six years, told BBC Sport on Tuesday. "If you thought you could get rid of me easily, you are wrong." Last year, Chabur was accused of misappropriation of funds and gross mismanagement while in charge of the SSFA. His presidency was saved by a letter in December from Fifa Secretary General Fatma Samoura, who recommended that he remain in office until given a chance to respond to allegations which he denied. This week's SSFA meeting also dissolved the 15-member Board of Directors until fresh elections scheduled for April, when a new office will be constituted.